Working his way through the Bible, Buck Denver has now reached the major and minor prophets! 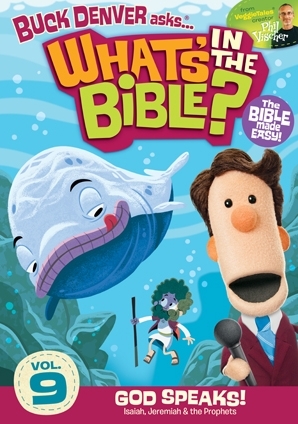 Entertaining, informative and ultimately Bible based these children's DVDs captivate the hearts and minds of the next generation. Join Buck Denver, Clive and Ian, and Captain Pete in the 9th exciting 'What's In The Bible?' DVD. - Hope-filled prophecies of Isaiah. 'What's In The Bible?' does what Horrible Histories did for history lessons. The fun-filled DVDs teach the Bible through colourful cartoon, silly songs, and quirky characters that captivate kids. In fact, even parents confess to laughing out loud alongside their kids. For those of you who are thinking - but what is 'What's In The Bible? ', watch the trailer above to get a taste of the educational fun you and your kids have been missing out. These DVDs have been entertaining many families, Sunday schools, and children's club all over the nation. And with a total of 13 in the series, it's not too late to catch up! Phil Vischer, the co-creator of the world famous Veggie Tales, has been hard at work stealing viewing time from Disney and Nickelodeon. His aim: to raise the next generation of Christians with the confidence to live what they believe. What's in the Bible 9 DVD by Phil Vischer was published by Jelly Fish Labs in September 2012 and is our 2869th best seller. The ISBN for What's in the Bible 9 DVD is 858100003083. Be the first to review What's in the Bible 9 DVD! Got a question? No problem! Just click here to ask us about What's in the Bible 9 DVD.